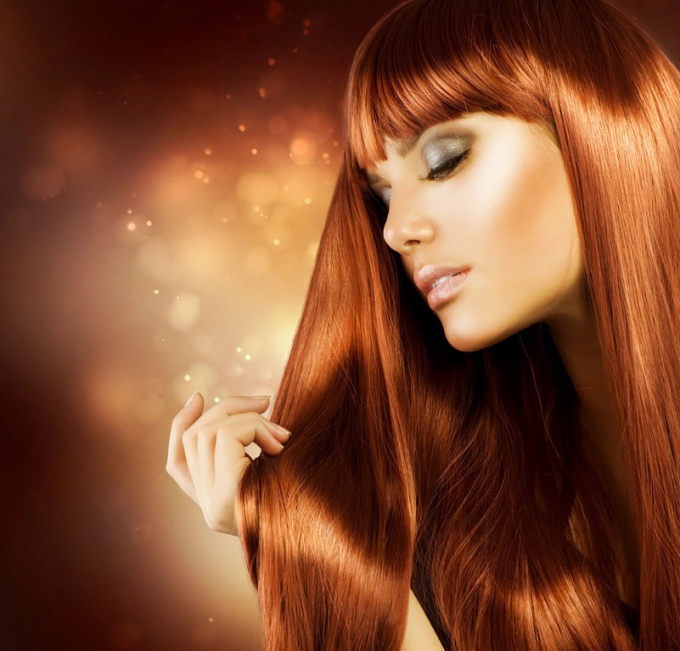 Salon hair coloring performed by master stylists, is the quality and makes the look of every girl attractive. However, knowing a few simple secrets, it is possible to dye the hair by yourself at home, the more that home hair coloring can cost less and take less time than going to the salon. is a special brush for dyeing hair. If the hair is short, it is enough 1 pack paint. For very thick hair to my shoulders or if they are longer, you will need 2 packs. In addition, if you decided to dyed long hair, it is best to stock up on 4 large Bobby pins or special clips that hairdressers use. Those girls who dyed their hair themselves, know that the process is quite time consuming, you have to find methods and postures to paint over the entire head. It is especially difficult to paint over the hair on the back of the head, have to do it in the truest sense of touch. It always happens that one awkward movement leads to the fact that the paint is on the neck, on the forehead, on the temples. In advance to protect yourself from this problem, causing the skin around the hair of the head rich cream or walk around these places with a lip balm or hygienic lipstick. Notice then how easy it wipes off the paint protected with these funds skin. To paint hair it is necessary to start from the back, so divide with a comb hair into 4 parts: front from forehead to neck, left temporal, right temporal and occipital. The paint absorbs better on damp hair, so, I lightly sprinkle or moisten them. with a wide - toothed comb, comb the hair. Modern color formulations hair is not spread out, so the head does not need to wear a cap. After 30 minutes just rinse the paint by shampoo for colored hair. In the packaging of paint is likely to be a packet of balm that softens hair, protects from aggressive influence of the chemical composition, makes hair shiny and smooth. Apply it on the head and after a few minutes rinse with water. If you decided to dye your hair at home by yourself, then knowing a few tricks will make painting more efficient, correct and as close to a professional. - at least 2 days prior to hair dyeing don't wash your hair. Clean hair is easier destroyed by the action of a chemical composition. 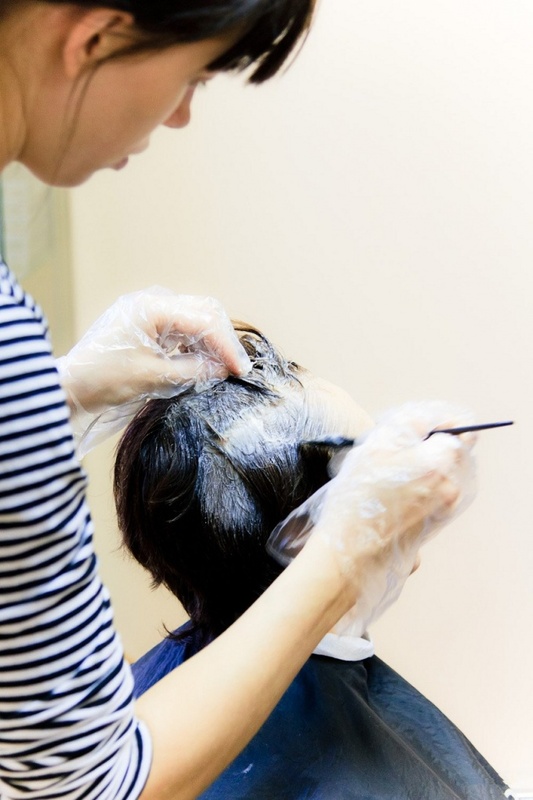 In addition, prior to painting do not use hair shampoo or 2 in 1, otherwise you risk to get not dyed strands. - do not hold paint longer than necessary. The view that if you hold the dye on the hair longer, the color will be more rich, is wrong. Almost every user on the coloring indicates the time of activity of the composition, usually 30 minutes. After this time the composition just ceases to operate. - the main thing – harmony. If you want to dye your hair at home by yourself, keep in mind that radical changes in the way it is better not to make. Hair color must match the color of the eyes and different from the main not more than 2 tones. If the mood changes quite opposite, go to the webmaster who will do it professionally. - do not wash your hair the day after hair coloring. Also, do not use varnishes, mousses and foams. The components included in their composition can prevent the absorption of paint pigment in the hair. - when painting hair, do not use a metal comb. The oxidation of the metal can play havoc with your hair color, so it is better to use wooden or non-metallic combs, at worst suitable plastic. - do not use a hair dye for coloring eyebrows and eyelashes. The temptation to tint the remnants of paint eyebrows and eyelashes can lead to the need to call an ambulance, the paint is dangerous to the health of the eyes. In addition, you risk being left without eyelashes and eyebrows, they will simply fall out. To dye hair at home by yourself is actually not as difficult as it may seem for the first time, just need to follow all the rules, follow the instructions on the package with paint and remember the little, but important tricks described above. Colouring hair helps women to refresh their color, change your style and hide the gray. All of it is good, but after some time the hairyou grow back and become visible roots, which, as a rule, the color are very different from the dyed hair. To have your hair cut was neat and tidy, the roots must be shaded and this should be done at least once in 1.5 – 2 months. The basal color can be done at the Barber, but to paint the hairat the roots you can and at home. An old shirt, a towel to cover shoulders and dirty paint clothes. Read carefully the instruction mandatory to every tube of paint. In a small bowl or a China mug, dissolve the coloring and oxidizing agents in the proportions specified by the manufacturer of the paint, carefully stir them together until a homogeneous consistency. Make sure that the paint was enough to evenly paint over all the regrown roots. Comb the hairs. If they are long, tear them into individual strands and secure each with a hair clip or a special clip for hair. Start painting from the back. Because to see this area of the head you pretty hard, even with a pair of mirrors will be better if you apply paint to the back of the head will help anybody from home. Apply the paint to the roots of the hair , strand by strand, trying to keep the paint from falling on that portion of the strands that has already been painted previously. After the head color of whiskey, then top. Note the time and close the head is a special hat so the paint does not spread. If it is thick enough, you can head does not close. Without waiting for 10 minutes before the time allotted according to the instructions on the staining, well comb hair, s, dispensing the paint from the roots along the entire length to the tips. Wait 10 minutes and rinse the paint with warm water. Apply to hairs balm or mask, hold the head a few minutes, so the nutrients have penetrated the hair. Rinse shampoo and dry hair. You cannot use metal objects for breeding paint or applying it on the hair. A Cup of is better to take the porcelain, and the comb is plastic. Basal staining is done on unwashed hair, as well as total colouring. Every woman, color hair faux paint, should know that after 4-5 weeks you will need to repeat the procedure. And most important – don't "miss" this important moment, otherwise regrown roots can ruin the whole effect of the former painting, and the strands will look sloppy and unsightly. comb with a few teeth and clips. Throughout the week, before painting, root touch-up mind the hair, apply a nourishing mask, which include components such as egg yolk, olive or vegetable oil, lemon juice and yeast. The day before painting staining test for allergic reaction: apply a bit of paint on my elbow, if the skin appears redness, can begin to paint. Paint roots of hair only on the third day after throttling. Read the instructions supplied with the paint to continue to avoid confusion with the hair color, and in accordance with it, prepare the paint. Throw on your shoulders a Cape or an old towel to protect the garment against accidental contact with the paint. For uniform staining spray the hair with water from a spray bottle. Comb wet hair comb with a few teeth and divide them into four equal parts, making two additions. Each part screw, and tighten the clamps. On the face bordering the hair, apply a rich cream and wear disposable gloves. Proceed to the coloring of the hair roots under the front clip, because in this place they are more likely to attract attention. With a brush apply a thin layer of paint first on the Central parting from forehead to nape, and then through every inch of make another parting and color roots on both sides. Each strand is painted set it aside until it has processed the entire front part of the hair. Then remove one clip at the nape, and from the top guide side parting. Lift the strand up and will color the roots, then put the painted strand forward. Make a new parting and repeat your actions until you paint all the hair in the occipital area. For oxygen, lift the hair comb top. After 15 minutes for even coloring comb the hair along its entire length. Then after another 15 minutes, wash off the paint with warm water and rinse your hair with shampoo. After painting in the beautiful hair color you look simply irresistible. But after a few weeks the roots are quite markedly different from painted parts, it looks untidy. Color the hair roots, without resorting to the hairdresser. Select in-store paint, the tone of which will correspond to the color of the hair, in which they were painted originally. It is advisable to use paint of the same brand. Then, following the instructions on the box, mix the ingredients in a ceramic or plastic Cup. In any case, do not use metal utensils, because it can change the properties of the paint, and the color work is not the same. Prepare a brush, take the comb, put on rubber gloves and throw with polyethylene on the shoulders (so as not to stain clothes). To start, divide the hair into two parts, heading from the middle of the forehead to the nape of the neck, and carefully RUB the roots with a brush and paint. Then divide the hair with a comb from ear to ear and plenty of paint mascara on the roots. In this case you will get four equal parts. Paint paint mascara on the space of roots of the hair above the ears. If the paint gets on the skin, promptly remove it using a cotton swab or cosmetic disc dampened with water. Coloring the roots of each strand of hair, separate it with the comb aside and continue to paint, moving from the back to the front of the head. Continue until until all roots are covered. Note the time and unable to do their household chores. After about twenty minutes, comb your hair, spreading the paint throughout. Apply the remaining ink mixture on your hair and leave for another fifteen minutes or twenty. After some time wash the head with warm water and shampoo. Use hair conditioner and rinse the head again. Not perederzhivat paint, otherwise in the end you'll have a visible boundary between colored hair and roots. Remember, in order to dye roots at home takes a lot of skill and careful application of paint without disturbing the painted hair. But it's better to use the services of a hairdresser, otherwise you may get an unsatisfactory result.